Hemingway started out life as an online-only text editor that offered a unique way to improve people’s writing, based on the style of author Ernest Hemingway, renowned for his brief sentences and simple language. Recently, the team behind the app launched a desktop version (for Windows and Mac) that allows for opening and saving files. This isn’t possible with the online version, so now you don’t need a second app just for that task. It also comes with a live preview pane that appears alongside your editing screen. Normally I write my articles with Draft after which I use StackEdit for proofreading and exporting as a Markdown (.md) file. Since I am on a constant search for the “one app that can do it all”, I’ve written this article only in Hemingway to see if I like it. The Hemingway Editor desktop app is a download for both Mac and PC, and costs US $4.99. While this isn’t a large amount, it is competing with many free online tools, including its own free, web-based version. First I’ll look at some of the features which make Hemingway an already popular tool among writers. I’ll then look at the extra features the app provides. The Hemingway developers have created a grading scale for your writing. They state you should aim for a 10 score or lower, to ensure its readable by as many people as possible. While this is a perfect way of measuring, there is one major flaw: It counts URL code as text. This means inserting a long URL can severely reduce your overall grade. Also, the longer your article gets, the less of an impact each sentence will have on the overall grade. This means your article can have several too-long sentences while still getting an acceptable grade. 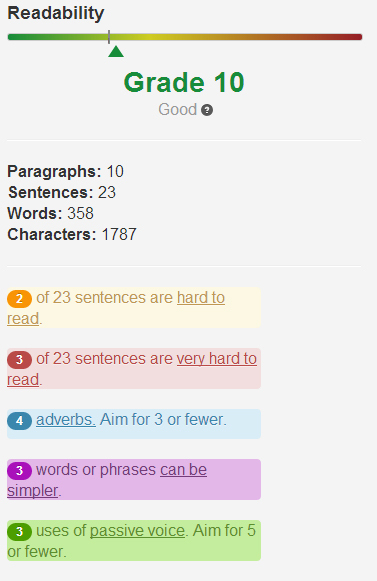 The app constantly counts your paragraphs, sentences, words and characters. The only really important figure here is the word counter, but the others don’t hurt, of course. Your sentences are analyzed and when Hemingway sees an opportunity to improve them the app will let you know by using colored highlighting. You are given advice on the length of sentences, adverbs, using simpler words and use of passive voice. I’ll use their own example “in excess of” to give this paragraph all possible colors and I have intentionally made this specific sentence to be very long to trigger the “very hard to read” color (which is red as you can see). Although it looks less colorful, there are still a few tips given. As an adverb, “very” should be omitted, but in this case it is quoted so I won’t change it. The last tip is given is for the phrase “is red”. The app thinks I should change that sentence as it believes I am referring to a red object in the passive voice. It shows Hemingway doesn’t understand the context of every sentence, which is why you should use caution when receiving its advice. So, the system isn’t flawless. Hemingway uses tooltips to help you correct your articles, but even these tooltips have flaws. They are not given for every example, so you need to hover over every colored box to see if there is a suggestion. I find this very distracting and even annoying. What’s even more annoying is the fact that you can’t ignore tips you don’t agree with by not having them colored. Every time you use the word “very”, the word gets marked to let you know it is an adverb and should be removed, even though I sometimes want to use this word when I do find something very annoying. Enough on the grammar advice. It’s a nice tool to help you write, but don’t rely on it too much. You can always decide to use the “distraction-free” writing mode in which the tips disappear. It also removes the word counter, which I personally want to keep alongside, but maybe that’s just me. You can find the aforementioned features in the online version as well, so let’s see what the desktop app brings to the table. They use this as one of their main selling points, but I wrote this specific paragraph in the online editor with my connection turned off. It still worked, but the document wasn’t saved until my connection was up again. The Desktop version does allow you to save your files locally but, unlike the online version, it isn’t saving automatically. So you could still lose you document if you don’t save once in a while. By default your documents get saved as .txt file, but you can also save as .md file. This way the Markdown formatting is preserved. I always like to use Live Preview when reviewing and editing my articles, especially when using Markdown. The desktop app comes with a Live Preview option, but I turned it off after using for only a few minutes? Why? It makes your text editor insanely slow. My computer is a powerful beast, so that shouldn’t be the cause. When using Live Preview your editing slows down, causing you to type in the dark since it takes almost a second to catch up. The Live Preview itself is even slower, taking several seconds to finally display what you’re typing. By itself this isn’t a problem (you aren’t constantly looking at it), but combined with the editing slowdown it is, again, very annoying. The Desktop app also comes with an error the online version doesn’t have: in some cases the colored sentences are overlaid, causing double lines. Both the online version and the desktop version don’t have any Markdown shortcuts like StackEdit has. I assume this should be easy to implement and should be an added benefit of the paid version. Now you’re wasting time adding the formatting yourself. Same goes for synchronizing to Google Drive or Dropbox. No problem if the free online version offers this, but why not add it in this paid version? Will I be using the Hemingway Desktop version? If they work out these glitches I will give it another try though, the potential is certainly there.